Apple, Nokia, Samsung, Sony and Microsoft is a big smartphones and tablets manufacturer giant companies and they are trying hard to get consumers attention by introducing promising and advanced Smartphone and Tablet devices. 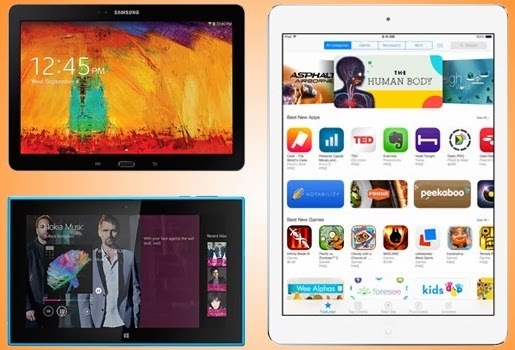 Apple with iPad Air and Retina iPad Mini 2, Nokia with Lumia 2520, Samsung with Galaxy Note 10.1 (2014, Sony with Xperia Tablet Z and Microsoft with Surface Pro 2 released it seems that Tablets war and battle has begins. 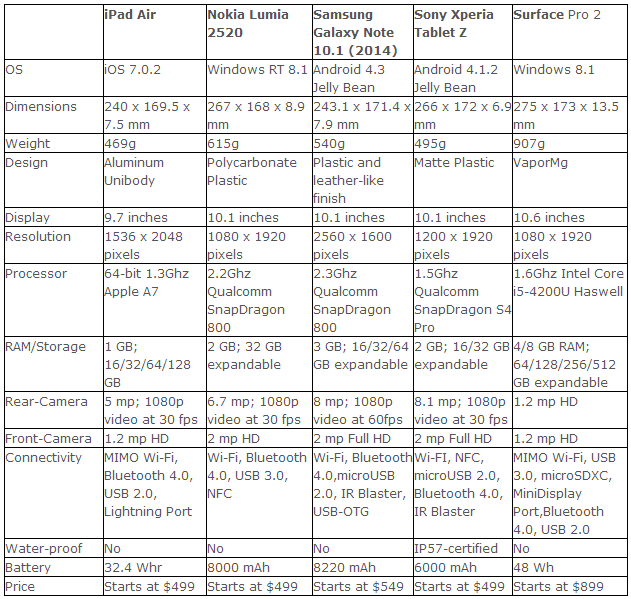 If you're thinking to purchase a new and innovative tablet device but not yet decided which one to go for yourself or for your friends from above mentioned brands and products than following Infographic on Lumia 2520 vs. iPad Air vs. Galaxy Note 10.1 (2014) vs. Surface Pro 2 vs. Xperia Tablet Z Price, Specifications and Features Comparison will clear your confusion and will also guide you to know which tablet device is best for purchasing.